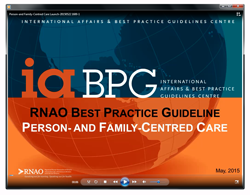 This nursing Best Practice Guideline (BPG) is intended to replace the RNAO BPG Client Centred Care (2002) and its supplement (2006). It is to be used by nurses and other members of the interprofessional health-care team to enhance the quality of their partnerships with individuals accessing care, ultimately improving clinical outcomes and the person and family’s experience of health care through the use of evidence-based person- and family-centred-care practices. 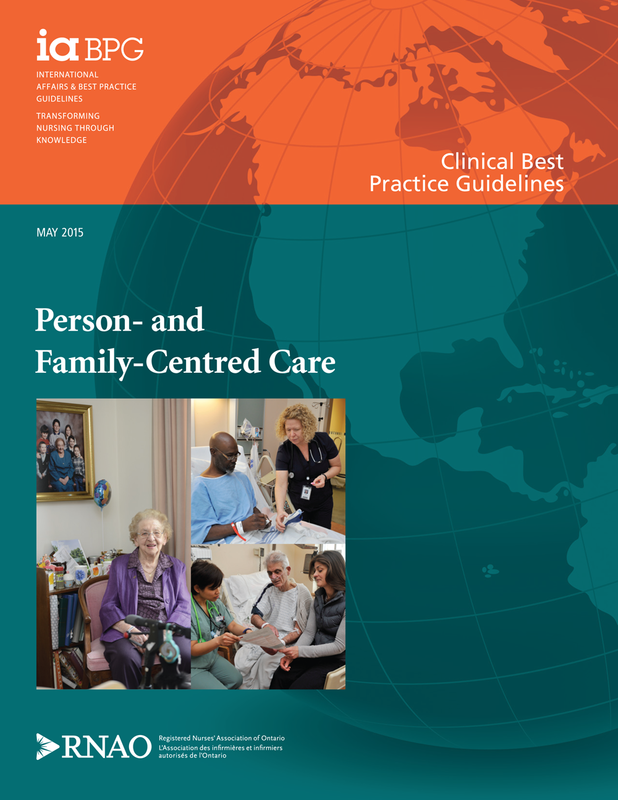 The purpose of this Guideline is to promote the evidence-based practices associated with person- and family-centred care, and to help nurses and other healthcare providers acquire the knowledge and skills necessary to become more adept at practising person- and family-centred care. The recommendations will help nurses and other health-care providers gain the knowledge required to partner and develop empowering relationships with persons accessing care and their families, in order to optimize health and wellness over their life continuum. This evidence-based approach, combined with a perspective that recognizes the place of the person at the centre of heath care, will improve individuals’ experience of and satisfaction with the care and services provided within the health system. It applies to all domains of nursing practice, including clinical, administration, and education. Practice recommendations are directed primarily to nurses and other health-care providers on the interprofessional team who provide direct care to persons in health-system settings (e.g., acute, long-term care, and home health care) and in the community (e.g., primary care, family health teams, and public health). Education recommendations are directed to those responsible for staff and student education, such as educators, quality improvement teams, managers, administrators, and academic and professional institutions. It is important to acknowledge that person- and family-centred care focuses on the whole person as a unique individual and not just on their illness or disease. In viewing the individual through this lens, health-care providers come to know and understand the person’s life story, experience of health, the role of family in the person’s life, and the role they may play in supporting the person to achieve health. This guideline replaces the previous BPG Client Centred Care.